I wrote here last April about the Wheaton Theology Conference which featured N. T. Wright. Never have I attended an event with so much electricity about biblical theology and serious dialog. It was a moment of my life that I shall always remember. Both devotees and detractors were present in the audience but more importantly I sensed the presence of the Holy Spirit uniting us in the oneness that we share in the Christ who justifies the ungodly in Jesus. Now we blessed to have the newly published book from that event: Jesus, Paul and the People of God: A Theological Dialogue with N. T. Wright (InterVarsity Press, 2011). The book comes at a great low price if you order it before the price soon increases, which it is sure to do after this pre-pub period ends. If you are serious, and I mean really serious, about engaging the profound theological insight and wisdom of this amazing teacher put aside all the books of the conservative/evangelical critics, who at times either do not understand Wright or have not even bothered to read him carefully, and hear how solid biblical critics engage with him and how he responds to their excellent questions. This book has plenty of the discussion, debate and questioning found in the event itself. The difference is that now we have this in print and these scholars understand Wright, engage with him seriously and do it with utmost civility. Does understanding Wright’s biblical paradigm make a difference to ordinary people and to congregations where I seek to equip people to be missional leaders? I am certain that it does thus for this reason alone I continue to urge readers to study the writing of this amazing man. Jeffrey Greenman, Wheaton’s associate dean of biblical and theological studies, said of this event: “Never before had we focused on interaction with one person’s theology. We felt N. T. Wright’s stature as a leading biblical scholar and his widespread influence in the church warranted a unique exploration of his thought.” This book takes that exploration to a more permanent level. Featured here in dialogue with Wright are scholars Marianne Meye Thompson, Sylvia C. Keesmaat, Brian J. Walsh, Richard B. Hays, Nicholas Perrin, Edith Humphrey, Jeremy S. Begbie, Markus Bockmuehl, and Kevin J. Vanhoozer. As I noted above I had the joy of being present for this event. You can still access the audio presentations on the Wheaton College internet site. Listening has a certain appeal and immediacy about it. But now we can ponder, read and reflect even more because of this first-rate book. A special word of thanks is here offered to Nicholas Perrin, of Wheaton, and Richard B. Hays, of Duke, for editing this excellent and important volume. From the first moment I heard the name of N. T. Wright, about twenty years ago I think, I was told to avoid him like the plague. Why? He was a dangerous man with a theology that would undermine the entire Protestant Reformation. Dutifully I avoided him because those I respected told me to do so. I limited my reading of Tom Wright to a few articles and to only one book about him (not by him). I was told that he embraced a position called “The New Perspective on Paul” (NPP). This position was a damaging (some say, quite literally, a damning) stance on Paul’s corpus of New Testament material because it directly attacked the most important truths of the Reformation. Thankfully a very good friend, who had taken the time to begin to read Tom Wright for himself, challenged me bluntly and forcefully to my face. In effect he told me to keep my mouth shut about Tom Wright until I had really bothered to read him for myself. In the mid-1990s I began to read Tom Wright and have appreciated his work profoundly ever since. Shortly after I began to study Wright’s work I decided to conduct an interview (a friend did it for our journal) with Bishop Wright. (He is the Anglican Bishop of Durham today.) We published this interview in our quarterly journal. Later on we did an entire issue of our journal on the theology of N. T. Wright. Time and again I heard stories of people saying that John Armstrong had given up the gospel and embraced the NPP. (Oddly, I heard all of this second-hand and in books and articles after the fact.) In almost every case the people who made these statements didn’t seem to realize that Wright actually did not promote the NPP at all. He is admittedly appreciative of certain aspects of the NPP and openly writes of which parts he agrees with and why. But it made no difference to his critics. A label was found and a great scholar, who was and still is doing some remarkable biblical work, was deemed dangerous. The only problem with all of this hype was that it all only made Wright more interesting to a horde of younger readers, some inquiring pastors who would still read beyond what they were told to read, and a lot of us who just wanted to know what the hullabaloo was really all about. The end result is that Tom Wright is now one of the most widely read biblical theologians of our time. I remember the first time I heard Tom Wright preach. I thought to myself, “If this man doesn’t preach Christ and the gospel then who does?” He warmly commended the grace of God and the sufficiency of Christ alone to save those who believed the good news. He spoke with spiritual fervor and human warmth. I knew heresy when I hear it and see it and this did not seem like heresy to me. I was not alone in this response. A growing number of people made this same discovery by meeting and listening to Wright and over time they too found Wright compelling in so many ways. Some years ago, before John Piper decided to write his book against Tom Wright’s teaching on justification, The Future of Justification: A Response to N. T. Wright, several friends joined me for an evening of discussion with John about Paul’s teaching on the nature of saving faith. It was a spirited and revealing dialogue. We clearly disagreed about some aspects of faith and the doctrine of imputation but parted peacefully. I had no idea, at least at that time, that John would eventually devote an entire book to this subject, seeking to show why Tom Wright’s views compromised the gospel at several serious points. Wright then answered John Piper in his 2009 book, Justification: God’s Plan and Paul’s Vision. I have longed argued that the vast majority of ordinary folks, and many pastors must also be included here, criticize Tom Wright without paying careful attention to what he has actually written or spoken. I often begin a conversation about Wright with one simple question: “What books of Tom Wright’s have you read in whole and what did you learn? Tell me what he actually says about such and such and tell me what did you object to and (very specifically) why?” The silence is often staggering. One critic, according to a source who knows this author personally and informed me of this fact recently, has read one small book by Tom Wright, What St. Paul Really Said. Based upon his reading of this little popular primer (with its one offensive chapter about imputation and 2 Corinthians 5:21) this man has written a rather large book that can very easily be construed as one of the more anti-Tom Wright books available to ordinary readers. (There are some excellent scholars who do disagree with Wright in a serious and engaging way and have done a wonderful job of expressing disagreement in a rigorous and proper academic way!) So hearing Wright critiqued in a context where he would personally interact with critics has always been a personal hope of mine. This is precisely what happened at the annual Wheaton College Theology conference on April 16-17. I was pleased to attend the entire event and enjoyed it immensely. I was not surprised, however, that I could not find a serious critic of Wright’s in the entire crowd as I mingled and engaged scores of people one-on-one. (I am sure there had to be a few in a crowd of 1,100 plus registrants!) The serious academic critics who disagree with Wright will tell you why. Some of this came out at the Wheaton Conference as you can see for yourself. He doesn’t pretend to have everything figured out and admits he is still thinking through the implications of his own paradigm. For those who are I remind you the same is true of great theologians of the past like Augustine, Luther, Calvin, etc. Scholars speak, for example, of the early-Luther, the middle-Luther, and the late-Luther. Why will we give him a pass and if a living teacher like Tom Wright admits he is growing this is a sign that he is dangerous? Like I tell friends, fall in love with the work of a theologian who is dead and things will be tidier and a great deal safer for you. This theology conference was filled with hordes of ordinary people, local church pastors and bible professors who have read Tom and wanted to hear him speak. Like me they wanted to hear various academics respond to his work in a gracious, critical and helpful way. You can be the judge of all of this for yourself since the entire conference is now available on video at Wheaton College. I hope you will take the time to watch and listen. I think you will find Tom Wright to be one of the truly great Christian thinkers of our time. And I also think you will be impressed by his gracious, humble and winsome manner throughout. If you are going to call this man dangerous then make absolutely sure that you know why before you repeat such a warning. If you are wrong then you may well be keeping yourself, and a lot of others, from the very theological truths that need recovery in our time so that we will discover the unity in the church that Jesus and Paul worked and prayed for in their own ministries. Personally, I think Bishop Tom Wright is very dangerous. I think he is dangerous precisely because he winsomely and powerfully challenges some esteemed (and I think incorrect) ideas that need to be challenged by a fresh and faithful biblical theology. He seeks a theology that focuses upon the Jesus who is revealed to us in the New Testament. He wants a theology that lines up with the central emphasis of the Apostle Paul upon our unity in Christ in the church. (He refers to this as covenantal inclusion!) Two presentations by Wright were the very best in this conference if you do not have time to watch them all. First, watch the short chapel address that he gave the Wheaton student body on Ephesians. Second, watch his Saturday night presentation on the theology of Paul. I was moved deeply by both messages and gladly commend them to you. Meanwhile, be forewarned. Tom Wright may well be a dangerous theologian in your life. I believe he is so dangerous that his work will very likely change your thinking in ways that call for repentance and real faith. He will make you see the Jesus of the Bible and long for the unity of the Spirit that Paul labored for throughout his entire ministry. I have grown to love Christ more by reading and listening to this highly esteemed teacher of the gospel of Christ. I believe this is a danger that we can afford to take on board when the church is in desperate need of a new biblical reformation. Well said. There are real differences in theology and these differences are important enough to warrant continued discussion and resolute effort to better understand why they really do matter. But the mindset many Catholics and Protestants have toward each other is locked into categories that they cannot escape. They can even argue that these categories are the equivalent categories of the Bible even though both sides should admit that for hundreds of years almost no one expressed the gospel in this way. Assuming that Luther’s insights into faith and grace are essentially right. I think they are fundamentally right but at the same time there is some serious overstatement at certain points. But are we limited to only Luther’s words and statements today? And assuming Trent got some things right, and it did, but missed on some others, which I also think it did, are Catholics stuck with every word and stroke of this council? Modern Catholic theologians do not think so or there never would have been the now famous Catholic-Lutheran Joint Declaration on the Doctrine of Justification, which is a magnificent document in my estimation. Should we proclaim that we must appropriate Christ’s death through personal faith in Jesus alone? Absolutely! But does this have anything to do with how we live? Absolutely. To proclaim Christ’s death without a call to spiritual formation and character is the very error Trent feared in Luther’s teaching. I think this led to them dropping a bomb that was not necessary but then I was not alive in those terribly difficult days when Christians attacked, and even killed, one another. Is it too much to hope that we, living in the twenty-first century, can do better? The Introduction to the book commences on a sombre note. That is to say, eternal life hangs in the balance: “How we live and what we teach will make a difference in whether people obey the gospel or meet Jesus in the fire of judgment…. This is why Paul was provoked at the false teaching in Galatia. It was another gospel and would bring eternal ruin to those who embraced it” (14). Now, Piper’s “conviction” is that Wright himself is not under the curse of Galatians 1:8-9 (cf. 24, n. 30), and yet the latter’s “portrayal of the gospel—and of the doctrine of justification in particular—is so disfigured that it becomes difficult to recognize it as biblically faithful” (15). Piper further maintains that Wright has engaged in no less than a “top-to-bottom rethinking of Paul’s theology largely different from the way most people have their New Testament in the last fifteen hundred years.” Hence, “When someone engages in such a thorough reconstruction, critics must be extremely careful” (16-17). Wright’s reconstruction is “global” in proportions and as such has collided with more traditional outlooks on Paul’s theology, especially as regards justification: “his paradigm for justification does not fit well with the ordinary reading of many texts and leaves many ordinary folk not with the rewarding ‘ah-ha’ experience of illumination, but with a paralyzing sense of perplexity” (24). Consequently, Piper prefers the older guides to the new when it comes to the “deeper issues of how justification really works both in Scripture and in the human soul…” (25, cf. 37-38). This manner of posing the argument makes for two rather noticeable inconsistencies. For one, if Wright’s portrayal of the gospel is what Piper claims, then how could the former not be under the curse of Galatians 1:8-9, if his portrayal is so disfigured that it becomes difficult to recognize it as biblically faithful? Is that not, more or less, what Paul thought of the “other gospel” of his opponents in Galatia? Of course, Wright is hardly under the curse, but these are strong terms and, as we will see immediately below, Piper does not carry them through uniformly. Second, it is none other than Wright who thoroughly concurs that “how we live,” as well as “what we teach,” has an effect on others. Ironically enough, it is Piper who downplays or at least refocuses the all-encompassing demands of the gospel as articulated by Paul’s phrase “the obedience of faith” (Romans 1:5; 16:26) as it relates to final justification. Piper’s initial sweeping criticisms are modified, if not mollified, as the book progresses. (a) Wright’s definition of justification may not be a devastating mistake, because it may simply conflate denotation and implication when it comes to the matter of covenant membership (44). (b) Wright does indeed use “justification” in more traditional ways (44). (c) Wright is quoted to the effect that in Jesus of Nazareth God had overcome evil and was creating a new world in which justice and peace would reign supreme (45), meaning in principle that Wright does see justification as a creative act. (d) For Wright, justification is both-and: the declaration of God the judge that one is in the right and one’s sins are forgiven and that one is a member of the covenant family, the people belonging to Abraham (53). (e) Wright even sounds Protestant (119-20). It will be salutary, therefore, for scholars and pastors and laypeople who do not spend much of their time reading first-century literature to have a modest skepticism when an overarching concept or worldview from the first century is used to give “new” or “fresh” interpretations to biblical texts that in their own context do not naturally give rise to these interpretations (36). These objections to historical exegesis, I must say, are hardly compelling. Scholars of the stripe of Wright are not unaware of the complexity of historical research and the many occasions on which historians must withhold judgment just because of the uncertainties entailed. The caveats advanced by Piper are well known, and no scholar of repute would engage in the oversimplified procedure envisioned by him. That said, it is possible to trace trajectories of Jewish thought from Ben Sira to the Mishnah, and it is possible to have a reasonably certain grasp of the theology engaged by Paul and the other New Testament authors. At this point in time, it should not have to be said that the New Testament documents were not, in the first instance, addressed to us; thus a common sense recognition of this basic datum must inevitably result in a certain amount of reconstruction of the context of Paul. This is not to make the context more important than the text, nor is it to say that Paul is not to be understood on “his own terms.” Rather, it is just Paul’s life-situation that serves to illuminate what “his own terms” actually are. When it comes to such central vocabulary items as “law,” “covenant,” “righteousness,” and “justification,” there is sufficient intelligibility from the sources that the so-called New Perspective on Paul may fairly claim to have shed considerable light on the actual issues under debate in Paul’s day. Certainly, caution must always be exercised in the weighing of historical texts. But even with all the caveats in place, the cause of biblical exegesis is not served by turning back the clock. Once a Copernican revolution has occurred, it will not do to retreat into a pre-Copernican universe. Piper, rightly in my view, maintains that justification for Paul entails more than a declaration that one is a member of the covenant (à la Wright). Instead, quoting Simon Gathercole: “God’s act of justification is not one of recognition but is, rather, closer to creation. It is God’s determination of our new identity rather than a recognition of it” (42). Even with the various qualifications allotted to Wright, Piper effectively scores some points regarding justification as the experience of salvation by arguing successfully throughout the book that it is a false distinction to bifurcate “justification” and “salvation.” In this particular regard, Piper’s discussion makes for helpful and even stimulating reading. From another angle, however, Piper’s criticisms fall short of the mark. Restating a thesis from previous publications, that God’s righteousness is “his unwavering commitment to act for the sake of his glory,” Piper calls into question Wright’s conception of righteousness as God’s covenant faithfulness, on the basis of Romans 3:1-8, 25-26. The problem is that Piper has failed to appreciate the factors of eschatology and theodicy. In 3:1-8, the issue at stake is God’s fidelity in the face of Israel’s infidelity (theodicy), a proposition to be unpacked in detail in Romans 9-11. The passage thus confirms, not disproves, Wright’s definition. In 3:25-26, eschatology and theodicy combine. The sins committed under the old covenant were not dealt with finally and definitively because God had predetermined (proetheto) that Christ would be the “mercy seat” (hilastērion): Christ is the ultimate expression of his faithful promise to forgive sins. This is eschatology. The theodicy factor is evident when the participle of 3:26 is read as concessive: “even while justifying the one who has faith in Jesus.” Paul’s entire statement, then, is to this effect: because of his determination that Christ would be the “mercy seat” for sins, he has remained faithful to his long-term plan to forgive his people’s trespasses, and all this even while justifying Jew and Gentile alike by the same means—faith in Christ. In so doing, God has not forsaken his people Israel. Rather, as Romans 9-11 is at pains to argue, his (pre)determination to save them was always by means of the gospel of Paul’s proclamation. “The Place of Our Works in Justification” (Chapter 7) is largely a discussion of Romans 2:13. Piper evokes the traditional category of the basis or ground of justification, in the present and at the end. As familiar as the approach is, methodologically it starts out on the wrong foot. The fact is that Paul hardly ever uses the language of “basis” or “ground.” Philippians 3:9, “the righteousness of God based on faith,” is the only clear instance, and even here the subject matter is not the “basis of justification,” according to the customary jargon. Rather, what characterizes Paul is prepositions of origin and sphere, mainly ek and en. Thus, contra Piper, “from works of the law” (ex ergōn nomou) (Romans 3:20, etc.) and “in the law” (en nomō) (e.g., Galatians 3:11; 5:4) designates the realm of the Torah, within which one might seek to be justified. By contrast, for Paul, one is justified “in Christ” (e.g., Galatians 2:17) and “from faith in Jesus Christ” (e.g., Romans 3:26; Galatians 2:16). (I have argued this in some detail in a forthcoming article in Journal of Biblical Literature, “Paul’s ‘Partisan ek’ and the Question of Justification in Galatians.”) Thus, to cast the issue in terms of the “basis” of future justification is to muddy the waters from the outset. There are two other problems plaguing Piper’s treatment of Romans 2:13. One is the disregard of the Jewish backdrop to “the doers of the law.” Paul’s language is derived from Leviticus 18:5 and recurring refrain of Deuteronomy, “this do and live” (4:1, 10, 40; 5:29-33; 6:1-2, 18, 24; 7:12-13; cf. 29:9, 29; 30:2, 6, 8, 10, 11, 16, 20; 31:12-13; 33:46). Moreover, in 1 Maccabees 2:67, the exact phrase “the doers of the law” designates loyalist Jews who would be vindicated by divine justice over against Gentile oppressors. The same combination of words occurs notably in the Qumran Habakkuk Commentary (1QpHab) 7:11; 8:1; 12:4. Paul thus lifts the working principle of “covenantal nomism” from the pages of Leviticus and Deuteronomy and transposes it into the eschatological context of faith’s obedience as directed toward Christ. For him, it is those who render faithful obedience, the “fruit of the Spirit” (Galatians 5:22-24), to Christ who will be vindicated in the last judgment. Wright, then, is correct that Romans 8:3-4 is the explanation of 2:13. The other exegetical difficulty is that of reducing Romans 2:13 to “public evidence and confirmation of faith at the Last Day for all who will finally be saved” (110). Quoting R. B. Gaffin, Piper is of the conviction that our works are not “(co-)instrumental…for appropriating divine approbation as they supplement faith” (116). But Romans 2:13 and kindred passages do not read well as simple evidence. Rather, “doing the law” is the precondition of eschatological vindication. Piper has abstracted 2:13 from 2:7: “to those who by patiently doing good seek for glory and honor and immortality, he will give eternal life.” On the other side, “for those who are self-seeking and who obey not the truth but wickedness, there will be wrath and fury” (2:8). Romans 2:7, 8 balance each other, and the courses of action depicted by them dictate the outcome of the judgment. Elsewhere in Romans, Paul likewise makes suffering with Christ (8:17) and confession of Christ (10:9-10) preconditions of future eschatological salvation. Reading Paul in this manner does not jeopardize grace, but rather informs us of how the covenant operates, with human response to God’s grace as the sine qua non of making the covenant “work.” It is true that Wright speaks of “evidence” (as quoted on 119-20), but the term is to be coordinated with his contention that obedience is produced in one’s life by the Spirit (119, 120). Piper accuses Wright of being unclear how being “in Christ” provides the foundation for final justification (121). However, the former’s quotations of the latter on 120 and 129 are as clear as can be. In point of fact, Wright is not at all ambiguous, as Piper alleges. Not unexpectedly, Piper is concerned to press for the doctrine of imputation of Christ’s active obedience, measured against which Wright falls short. Since I have replied at length to Piper’s earlier and kindred work, Counted Righteous in Christ: Should We Abandon the Imputation of Christ’s Righteousness? 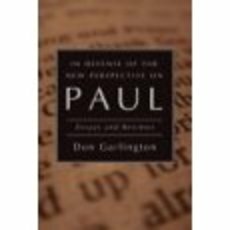 (Wheaton: Crossway, 2002, in my In Defense of the New Perspective on Paul: Essays and Reviews [Eugene, OR: Wipf & Stock, 2005], 107-97), I will simply cut to the chase here. (a) By Piper’s own admission, Wright’s remark on Galatians 2:19-20 places him in virtual agreement with the sum and substance of imputed righteousness (126). All the benefits of Christ’s work are to be had by Wright’s understanding of union with Christ without the mechanics of imputation. (b) Piper advances a succession of non sequiturs, if one “says no to imputed obedience,” as though without imputation there is no foundation for a future justification (128-29). Again, “in Christ” provides the foundation. (c) There is the matter of “faith alone,” which, Piper claims, is undermined by Wright’s correlation of the verdict of the last day with the entirety of one’s life (129). Once again, however, when Wright is allowed to speak for himself, as per the quote on 130-31, precisely the opposite turns out to be the case. Wright’s excellent comments on “the obedience of faith” maintain that faith and obedience are not antithetical, and these remarks are not at all ambiguous and unclear, in spite of what Piper claims. Besides offering no comment at all on the important verse Romans 1:5, in his zeal for “faith alone,” Piper has failed to distinguish between the Already and the Not Yet. Wright acknowledges that Already-justification is by faith alone, but Not Yet-justification entails faith’s obedience consisting in perseverance and covenant service. The brand of sola fide forwarded by Piper is simply not in the New Testament (as per, e.g., Romans 4:19-25; 2 Corinthians 5:10; James 2:18-26). Ironically, to be sure, Piper commences his book with the quotation from Solomon Stoddard, but it was just Stoddard’s illustrious grandson, Jonathan Edwards, who espoused a clear-cut theology of future justification inclusive of the obedience of the Christian. Chapter 10 engages Wright’s take on Paul in relation to Second Temple Judaism. Piper presses for a “legalistic” understanding of the Judaism of this period, arguing that legalism and ethnocentrism are virtually one and the same, inasmuch as both are rooted in self-righteousness. 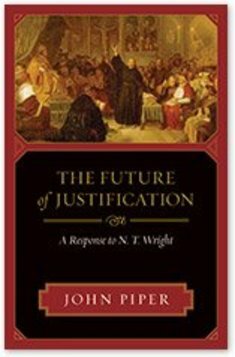 Regarding 4QMMT in particular, Piper simply asserts that Wright’s understanding of justification is not served by this text, without presenting any particular analysis of it. However, a truly responsible treatment of MMT, such as Martin Abegg, “4QMMT, Paul, and ‘Works of the Law,’” The Bible at Qumran: Text, Shape, and Interpretation (Grand Rapids: Eerdmans, 2001), 203-16, demonstrates ably enough that Wright is more in tune with the intention of the document than Piper. 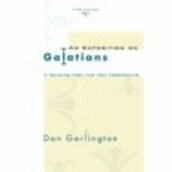 And because of his “pre-Copernican” outlook on first-century Judaism, there is a strained and unconvincing attempt to read “legalism” and “self-righteousness” into the portrait of Pharisaism found in the gospels. This is why, when Paul looks ahead to the future and asks, as well one might, what God will say on the last day, he holds up as his joy and crown, not the merits and death of Jesus, but the churches he has planted who remain faithful to the gospel. Piper is astonished that Wright would pen such a sentence, especially given the impact he fears that such a statement will have on preaching, which is why this book was written (167, 187-88).Yet all one has to do is read the page from which this quote is lifted. Wright is not denying "the merits and death of Jesus" for Paul's theology as such, but rather they are not the focus of Romans 8:1-11! Piper’s Conclusion is at heart a plea not to let “works” “add to the perfection and beauty and all-sufficiency of Christ’s obedience…” (187). To do so would be a “double tragedy.” However, such alarmism is simply unnecessary and misjudges positions taken by Wright and others. Effectively, Piper gives the whole case away when he underscores the necessity of the fruit of the Spirit on the part of the believer (186-87). And his fear that such obedience might add to the work of Christ is, for the most part, not grounded in reality. In sum, Piper’s response to Tom Wright is worth reading for those interested in the seemingly never ending debate over justification. On the couple of issues noted above, I should think that Piper has the better of the argument. But for the most part, he has failed to demonstrate that Wright is wrong. The claim that the latter’s paradigm for justification “leaves many ordinary folk not with the rewarding ‘ah-ha’ experience of illumination, but with a paralyzing sense of perplexity” (24) is simply too subjective to be a useful criterion. In a nutshell, this book is mostly a defense of traditional doctrines, with a minimum of persuasive exegesis and a heavy reliance on confessionalism. As a pastor, it is understandable that Piper has a pastoral concern. But is Wright’s theology of justification so dire that it is apt to result in Piper’s “double tragedy?” I think not, especially given Piper’s concessions as indicated above. In my estimation, Wright is the one who has “delivered the goods” when it comes to penetrating exegesis and, dare one say, fresh insight into the letters of Paul. It is also understandable that Piper would want to allay the “confusion” he senses on the part of his church members. However, I must say that such “laypersons” would have to be theologically literate indeed to tackle this book, not least its microscopic footnotes. Otherwise, the confusion is liable to remain! As much as anything, this book is flawed by its near phobia of anything that smacks of newness and freshness, which, for Piper, must be suspect by definition. This is why we are exhorted to be suspicious of “our love of novelty” and eager to test biblical interpretations by “the wisdom of the centuries” (38). Agreed, but surely “the wisdom of the centuries” includes our own century. Wright is precisely correct: we are “to think new thoughts arising of the text and to dare to try them out in word and deed” (quoted on 37, italics added). Dr. Piper would do well to remember Matthew 13:52: “And he said to them, ‘Therefore every scribe who has been trained for the kingdom of heaven is like a householder who brings out of his treasure things new and old’.” I would say the appropriate response to matters “new” and “fresh” is not skepticism but the Beroean spirit of searching the Scriptures to see if these things are so (Acts 17:11). *Dr. Don Garlington is a professor and author who lives in Ontario, Canada. He is a long time friend of ACT 3 and a frequent contributor to various academic journals and books. He is a scholar in the theology of Paul, having done his PhD under the famous James D. G. Dunn, and has frequently contributed written work to ACT 3. He is a contributor to a new book on this same subject that is available from the ACT 3 online store, titled: A Faith That is Never Alone, P. Andrew Sandlin, editor (2008).